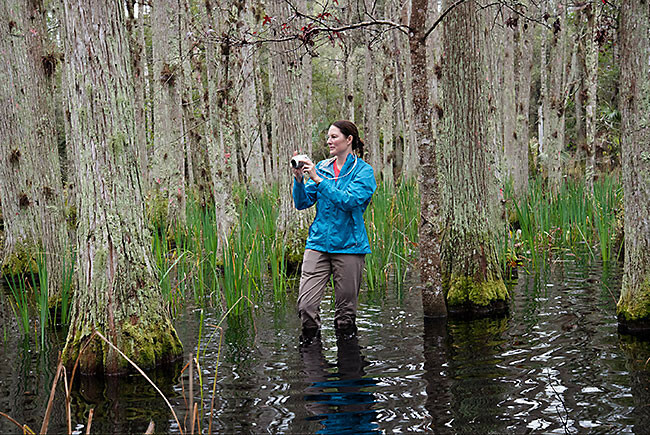 Florida Wildlife Corridor Expedition team member Mallory Lykes Dimmitt wades out into a swamp within the Green Swamp to capture a photograph. 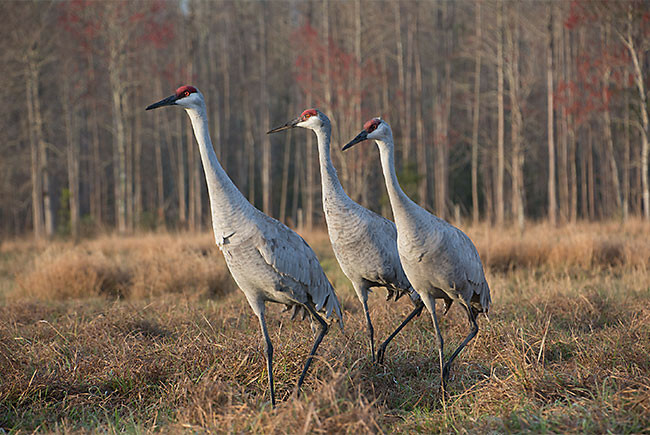 Florida Sandhill Cranes forage on a private ranch in the Green Swamp. 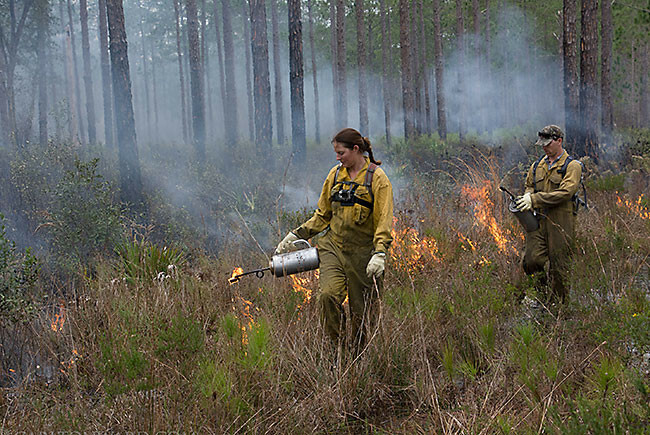 Florida Wildlife Corridor Expedition team members Mallory Lykes Dimmitt and Joe Guthrie help ignite a prescribed fire in Green Swamp East. After leaving the Everglades Headwaters, the Florida Wildlife Corridor Expedition team spent the rest of the first week immersed in the Green Swamp Wilderness Preserve in Central Florida, a little known part of the state hiding within plain sight of Tampa's and Orlando's sprawling metropolitan areas. The swamp spans five counties and 560,000 acres, a majority of which is designated as an Area of Critical State Concern for the purpose of protecting Florida's water supply. As the headwaters of four of Florida's rivers and an important groundwater recharge area for the Floridan Aquifer that provides drinking water to Florida and parts of Georgia and Alabama, the Green Swamp is a significant stepping stone in the network of protected areas that anchor the Florida Wildlife Corridor. Wildlife is abundant in the swamp, and in order to keep track of all the birds and animals seen, the Expedition team recorded a species list, below, that we'll update throughout the trek. The highlight of our Green Swamp experience, after backpacking and camping in a soaking rain befitting of the region, was participating in a controlled burn with land managers from the Southwest Florida Water Management District. Fire is an important management tool across all of Florida, and the swamp is no exception. We were lucky that favorable weather allowed the burn to happen as planned while we were in the region, and we were thrilled to help ignite, photograph and film this fire. The benefits of prescribed fire are many, including reducing fuels to mitigate potentially hazardous wildfires, wildlife habitat improvement, insect and disease control, encouraging new growth of native vegetation, and maintaining habitat for plant and animal species that depend on periodic fire.